The superb image quality of the iiyama ProLite E2280HS LED monitor will make it easy for you to watch anything. The foundation that it's built on is the modern LED backlight, which ensures an excellent contrast ratio with deeper blacks and clearer whites that further contribute to its high dynamic contrast ratio of five million to one. The E2280HS is equipped with two digital inputs (HDMI, DVI), analogue VGA, and stereo speakers. There is a basic positioning capability represented by forward and reverse tilt options. Alternatively, you can purchase any ergonomic stand or wall mount system that supports the VESA 100x100mm standard. By meeting the demanding Energy Star/TCO standards with an operating power of twenty watts, the E2280HS saves not only our planet, but also your money. DVI cable, 3.5mm jack cable, Power cable Done! For shipping to other EU countries visit this page 21.5" iiyama ProLite E2280HS-B1. 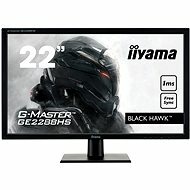 Für Versand nach Deutschland, besuchen Sie bitte 21.5" iiyama ProLite E2280HS. Chcete doručit zboží do Česka? Prohlédněte si 21.5" iiyama ProLite E2280HS. Chcete doručiť tovar na Slovensko? Prezrite si 21,5" iiyama ProLite E2280HS. Für Versand nach Österreich, besuchen Sie bitte 21.5" iiyama ProLite E2280HS. Magyarországra történő kiszállításért tekintse meg ezt a termékoldalt: 21.5" iiyama ProLite E2280HS.